Literally any room with an open wall can instantly become a full-fledged home theater with one simple purchase. 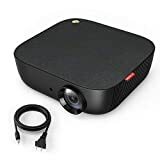 The Nebula by Anker Prizm II 3600 Lux Native Full HD 1080p LED Multimedia Projector sports a Full HD LED lamp as well as dual deep bass speakers all in a compact enclosure. Hook up your Roku, Fire TV, Apple TV, video game console, smartphone, laptop, or just about anything else you can imagine and you’re done! It retails for $300 but if you use the coupon code PZM4EVER at checkout on Amazon you can snag one today for only $199.99. Full HD Picture: Place in virtually any room to enhance your favorite shows or movies with a native full HD 1080p 40″-120″ picture. (Recommended for use in low-light environments). Built-In Speaker: Dual drivers deliver balanced audio through left and right speaker grilles, pumping out a deep, immersive bass sound. Keystone Correction: Horizontal and vertical (±40°) adjustment ensures a clear picture from any distance or angle. Comprehensive Compatibility: Connect almost any device including Fire TV Stick, Chromecast, Roku, Xbox, and PS4 via HDMI or USB Lightning cable. Durable Design: UL Certification and a 30, 000-hour LED lamp-life ensure that you can enjoy decades of worry-free entertainment.